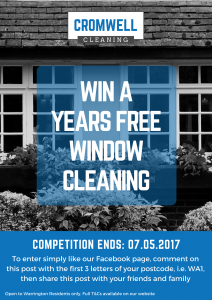 To celebrate the launch of our new brand, Cromwell Cleaning, we’re giving away a year’s FREE window cleaning to one lucky winner! Like, Comment and Share…to enter you need to live in Warrington, like our Facebook page and comment in the competition Facebook post with the first 3 letters of your postcode, i.e. WA1, then share the Facebook post with your friends and family. Closing Date for entries: 11pm on Sunday 7th May 2017. The winner will be announced by 1pm on Tuesday 9th May 2017. Head on over to our Facebook page to enter. 1. This competition is open to residents of Warrington only and the property to be cleaned must be located in the Warrington area. 2. Only one entry per person is valid, however multiple residents of the same property may also enter. 3. Competition is open to new and existing customers. 4. Any entries received after the closing date stated will not be valid. 5. The 1st free clean must be scheduled to commence within 4 weeks of the competition close date. 6. Window cleaning will take place every 4 weeks over a 12 month period (13 cleans in total) as per our regular window cleaning round. 7. Each 4 weekly clean must be taken consecutively and cannot be carried forward. 8. Offers may only be redeemed against the service specified. 9. Cannot be used in conjunction with any other offers, and no cash alternative is available. 10. Competition closes at 11pm on Sunday 7th May 2017, any submissions received after this time will not be entered. 11. The winner will be randomly selected and announced on Facebook by 1pm on Tuesday 9th May 2017. 12. If the winner does not respond within 72 hours of being announced they forfeit their prize and a new winner will be randomly selected and announced on Facebook by 1pm on Friday 12th May 2017. 13. We reserve the right to withdraw offers at any time. It’s been a very exciting start to 2017 as we began our journey as Cromwell Cleaning. Our company has changed so much in the last 10 years and we wanted something fresh to continue our success into the future. As a local company our roots are well established in Warrington, and we wanted a name that is part of Warrington’s history – there were many we could have chosen, Wire, Wolves, Yellows – but we love the history of when Oliver Cromwell stayed in Warrington during the English Civil War, and that several of the buildings that were used during the war still stand strong today. That felt like the right fit for our business, strength, sturdiness and resilience. As a customer how does our re-brand affect you? Please rest assured our re-brand will cause absolutely no disruption to your usual window cleaning service. We haven’t changed owners, or merged with anyone else; it’s simply a new name with the same great service. If you are a commercial customer please make sure you inform your accounts payable if necessary to ensure invoices are paid within the given time frame. Don’t worry if you accidentally contact us using our old contact details, we will keep those accounts live for a short period. We’re very excited about what the future holds for Cromwell Cleaning and hope you will join us in embracing the new brand. If you do have any questions, or if we can provide any additional information please do get in touch. It’s been a very exciting start to 2017 as we’ve been developing our new brand. If you happen to have stumbled across this site before our official launch date on the 27th March 2017 then hello and welcome to our new brand Cromwell Cleaning! We’ll be posting further news on the 27th March when we officially launch, so please keep an eye out and check back here for all you need to know about our rebrand. We hope you’ll join us in embracing our new name and look forward to continuing providing you with the same quality service for the long future ahead.